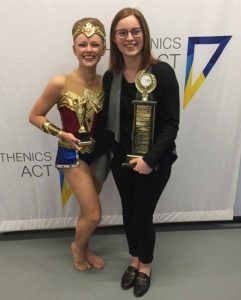 Although Calisthenics is predominantly a team sport, there are solo and duo competitions offered to those that wish to extend their calisthenics experience. Many of Evatt’s coaches offer Solo and Duo training. 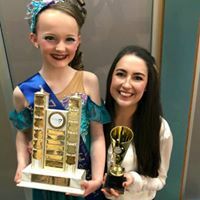 Training includes extra coaching per week and costs are involved such a hall hire, coaching fees, costumes and competition entry fees. All solo/duo competitors must be actively involved in the Calisthenic Skills Program. There are three disciplines: Graceful Solo, Calisthenic Solo and Calisthenic Duo. 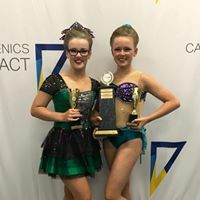 There are opportunities to be chosen to represent the ACT at the ACF Nationals from places gained during the ACT competitions. Calisthenic Solo is a combination of strong movements involving high levels of flexibility, extension of movement, control and uniformity of rhythm, testing an individual’s natural grace and dance stamina, flexibility and timing. It is optional for competitors to use hand props or apparatus. Graceful Solo is an individual’s ability to interpret music through graceful flowing and ballet movements, feeling and softness demonstrated through body movements and facial expressions. Similar to the Calisthenic Solo, but where two competitors perform together interpreting a theme and often characters. Performers must interact and relate to one another. Often these routines are comical and very enjoyable for the performers and audience.